Plant Superintendent, Gill Ranch Storage. Farm Bureau member since 2011. What is Gill Ranch Storage? 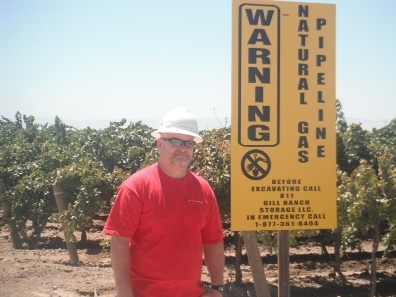 Gill Ranch Storage uses depleted gas reservoirs to store natural gas underground. The facility has been operational since October 2010, and includes a pipeline that links to Pacific Gas and Electric Company’s (PG&E) mainline transmission system, allowing it to serve customers throughout California. Who operates Gill Ranch Storage? The site was developed in a joint agreement by Gill Ranch Storage, LLC and PG&E. The storage facility and pipeline are operated by Gill Ranch Storage, LLC, a subsidiary of Portland, Oregon based NW Natural, a company that provides natural gas service to about 675,000 customers through 15,000 miles of mains and service lines in western Oregon and southwestern Washington. NW Natural also operates an underground storage facility in Oregon, which serves utility customers and the regional interstate storage market. NW Natural builds facilities that meet or exceed state and federal safety regulations and has received praise from regulators for environmental practices. Gill Ranch Storage has right-of-way agreements with landowners to build, operate, test, maintain, and protect its pipeline. The right-of-way for most of the Gill Ranch Storage pipeline extends 25 feet from each side of the pipe. What do I need to know if there is a pipeline right-of-way on my property? The pipeline right-of-way must be kept clear of obstructions in order for us to respond to emergencies and perform required maintenance activities. Do not place buildings, swimming pools, sheds or other structures on the pipeline right-of-way. Also, do not plant trees or shrubs on the right-of-way. What should I do if I want to excavate or dig near a pipeline right-of-way? Call 8-1-1 or the One-Call System in your area at least 48 hours before excavation is scheduled to begin. Trained technicians will mark the location of the pipe at no cost to you. Be sure to respect the line markers and dig with care. Why do I need to call 8-1-1 before I dig? Statistics show that damage from excavation-related activities is the leading cause of pipeline accidents. Protect yourself and call before you dig. What about the yellow pipeline markers? What if I touch or hit a natural gas pipeline while digging? Contact Gill Ranch Storage immediately at 877-361-8404. If the pipeline is leaking, please call 9-1-1. Even if the pipeline is not leaking, a gouge, scratch or dent to the pipeline or its coating may cause a future safety problem. It is important that we inspect and repair any damage. How do I recognize a gas pipeline leak? Natural gas is colorless and odorless. A harmless odorant is added so that leaks can be detected by a “rotten-egg” smell. Some indicators of a gas leak are: A gas or petroleum odor; a hissing sound; blowing dirt, grass or leaves near a pipeline; water bubbling or blowing into the air at a pond, creek or river; a patch of dead grass or vegetation in an otherwise green area; or flames coming out of the ground or burning above the ground. Immediately leave the area on foot and in an upwind direction. Warn others to stay away. From a safe place, call Gill Ranch Storage at 877-361-8404 and 9-1-1, or your local fire or police department. Do not bring open flames, smoking materials, cell phones, flashlights, motor vehicles or other sources of ignition into the area. Don’t attempt to operate any pipeline valves and don’t attempt to put out a gas fire. According to the National Transportation Safety Board and the U.S. Department of Transportation, natural gas pipelines are the safest mode of transportation. Federal and state regulations govern the design, construction, operation and maintenance of pipelines. Gill Ranch Storage complies with these regulations and has an excellent safety record. Experienced personnel regularly inspect and maintain pipelines, and crews are available to respond to problems 24 hours a day. Volunteering is an important part of our company culture. We are active in a variety of civic and non profit organizations that better the community. The Farm Bureau is a useful resource to ensure we understand issues facing the farming community. This knowledge allows us to have an effective relationship with the area’s farmers and businesses.